The great trading city of Carthage is located in North Africa. The city of Carthage has had its power weakened by Rome. 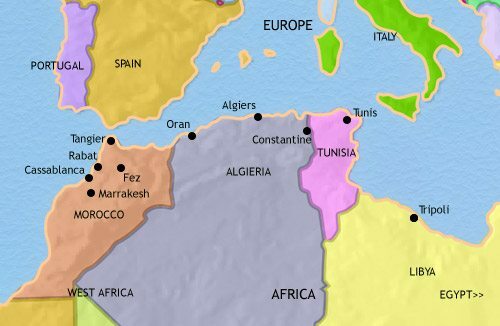 North Africa has now largely fallen under the power of Rome. North Africa is one of the most prosperous and Romanized parts of the Roman empire. 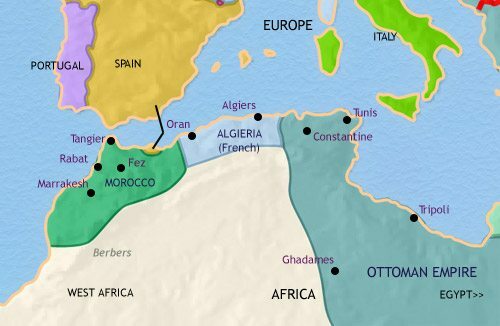 Having been ousted from Spain, Almohad power soon collapsed in North Africa as well as it fell victim to internal strife and became fragmented amongst regional dynasts. 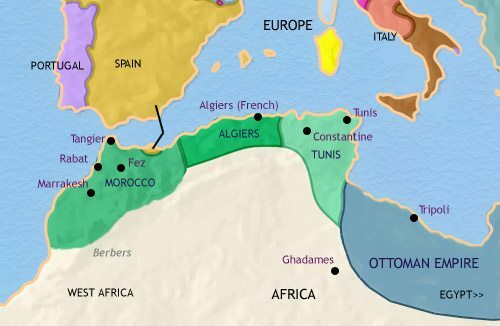 In the 1230’s independent dynasties became established at Tunis, at Tiemcen and at Fez, in Morocco, and the Maghreb became divided along lines very similar to the present day. 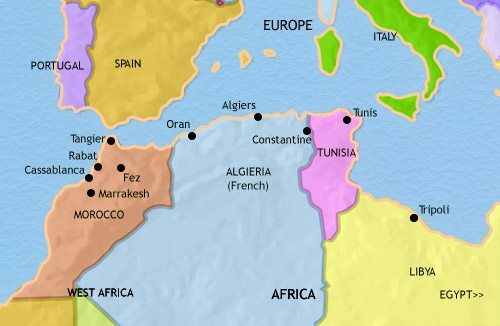 Over the past few centuries, the people of North Africa have become mainly Arab-speaking, thanks to the large-scale immigration of Arab tribes into the region from the 11th century onwards. Carthage was founded shortly after 1000 BCE by Phoenician colonists from Syria. In the following centuries the city flourished, and has become the great trade emporia of the western Mediterranean, dominating not only with its merchant ships but with its fighting navy as well. 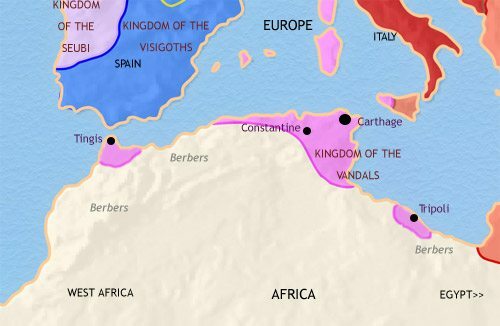 To secure its position, commercially and militarily, Carthage has set up colonies along the North African coast, in the Balearic Islands and in Spain, and has established control over the cities of western Sicily. The great city-state of Carthage has recently been defeated in two long, bitter wars with her arch-rival, Rome. In the second war (218 – 202 BCE), her great general, Hannibal, came near to utterly destroying Roman power. He was unable to do so because Rome’s allies remained largely loyal to her, and, after years of fruitless campaigning, he returned to Carthage, only to lead the Carthaginians to final defeat at the battle of Zama (202 BCE). As a result of her defeats, Carthage’s overseas dominions have been stripped from her, and have come under Roman control. 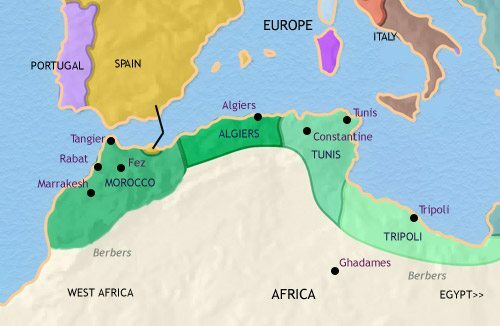 Nearer home, Berber kingdoms have emerged in North Africa. These have been drawn into the struggles between Carthage and Rome, as allies of one side or the other. The best known of these kingdoms is Numidia, which has become Rome’s main ally in the region. Carthage began to recover her commercial prosperity after defeat in the 2nd Punic War, but this only aroused the fear of the Romans. In 146 BCE they destroyed the city once and for all, selling 50,000 of her people into slavery. 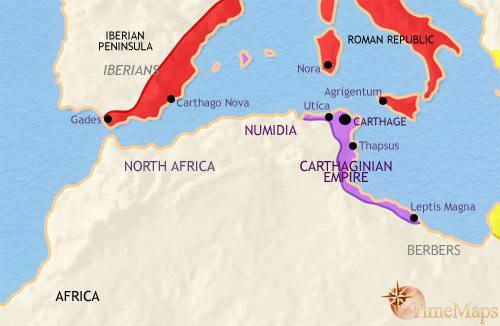 Other Carthaginian cities such as Utica and Hadrumetum sided with Rome in this struggle and survived under Roman authority. 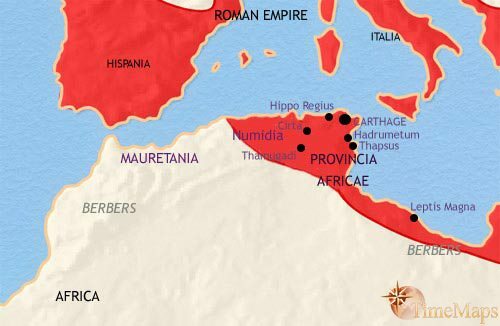 During the first century the Berber kingdom of Numidia was brought under Roman control after prolonged fighting, but remained a client kingdom until the time of Julius Caesar, when it was brought into the Roman province of Africa. At that same time a Roman colony was planted on the site of the old city of Carthage. 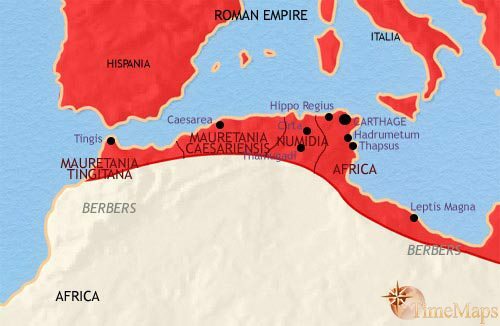 Beyond the Roman frontier nomadic Berber tribes continue to carry out small-scale raids, whilst the kingdom of Mauritania, emerging in the late 2nd century BCE, has become virtually a client state of the Romans. Roman control in North Africa was completed under the emperor Claudius, when the kingdom of Mauritania was annexed. The rest of the region is disturbed now and again by small-scale raids by the nomadic Berber tribes of the desert, but the imperial frontier has been pushed out to the south and the border tribes settled on farmland to form a buffer between the desert and the Romanized zone. This has experienced a general peace for the past two centuries. North Africa has become one of the most prosperous regions within the Roman Empire, with many flourishing cities. 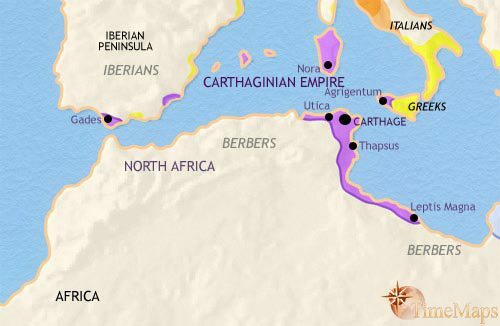 Carthage is one of the largest and wealthiest cities in the Roman world. By this date many Roman senators are from North African backgrounds, and the current emperor, Septimius Severus, is himself an African. Much of Rome’s grain comes from the region, which also produces olive oil and fish, as well as wild animals for the circus. In the 5th century, during the general disintegration of Roman power in the western empire, North Africa was invaded by a German tribe, the Vandals. These have been able to establish a powerful kingdom, and have become a significant naval power, dominating the western Mediterranean. In 455 the Vandals attacked Rome itself. Their control over the rich grainlands of North Africa, and their denial of grain to the inhabitants of Rome, has had an even more marked impact on the decline of the imperial city. Nevertheless, within their own territory, the Vandals have taken to Roman life and culture, and preserve a level of stability which has allowed trade to recover to a certain extent. The Vandal kingdom in North Africa flourished until 534, when it was overthrown by a small but highly effective Byzantine army under the command of the brilliant general, Belisarius. 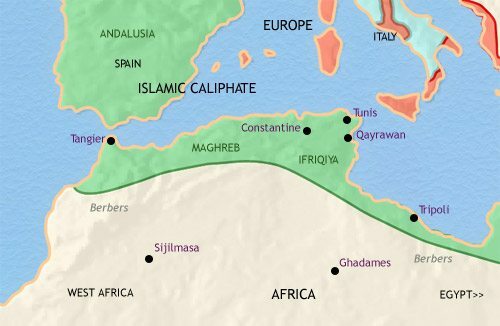 North Africa then remained under Byzantine rule until Arab armies swept in from Egypt in the late-7th century. The Berber tribes of North Africa were quickly incorporated into the Islamic community, a process assisted by the similarities between Berber and Arab lifestyles and tribal structures. Berbers formed a large part of the army which, almost immediately after their own conquest, went on to conquer Spain. From the mid-8th century, North Africa fell away from effective rule by the Caliphs, now ruling from distant Baghdad, and came under the rule of independent governors. However, these local dynasties were short-lived. The Berbers, perhaps because of their egalitarian tribal structures, were particularly attracted to the more puritanical forms of Islam. In the early years of the 10th century, North Africa was swept by a fervent Islamic movement, that of the Shi’ite Fatimids. 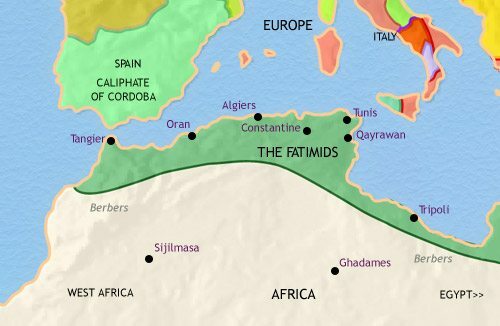 The Fatimid leaders united the whole of North Africa under their rule before conquering westward into Egypt and beyond. At this date they have recently relocated their capital from near Tunis to Cairo, in Egypt. 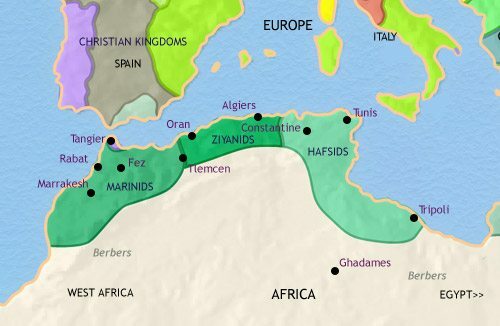 Having conquered Egypt, the Fatimids neglected the Maghreb and allowed a regional dynasty called the Zirids to take control. Zirid power soon fragmented into three independent states. The Maghreb was then deeply affected by a migration of Bedouin tribes westwards from Egypt. This caused immense disruption, and undermined urban life and culture in the region. 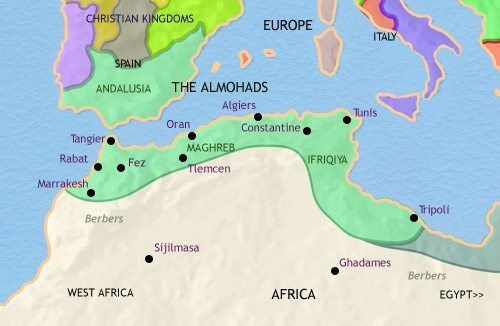 In the 11th and 12th centuries North Africa fell under the control of two successive Islamic movements, the Almoravids and the Almohads. 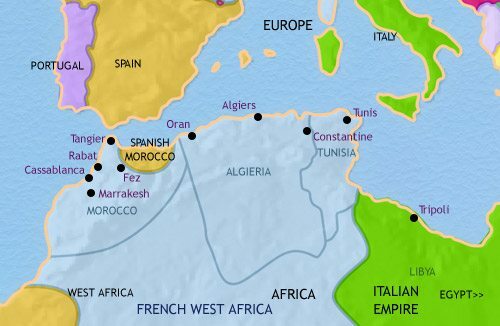 Both these conquered not only North Africa but also Andalusia. In the past few years, however, the Christian victory at Las Navas de Tolosa (1212) in Spain has forced the Almohads back to the Maghreb. From the early 16th century the coastline of North Africa has become a haven for “corsairs”, sea-raiders who range ever further across the seas, capturing Christian ships, enslaving their crews and passengers, and then ransoming them for their freedom. These activities have continued despite (or indeed because of) the Maghreb being incorporated into the Ottoman empire. The region has retained a great deal of autonomy, being ruled by its own deys. Morocco has experienced a different history. In the late 16th century the ruler of Morocco sent an army across the Sahara desert and conquered the huge Songhai empire of West Africa. For a time, Moroccan power straddled the Sahara. 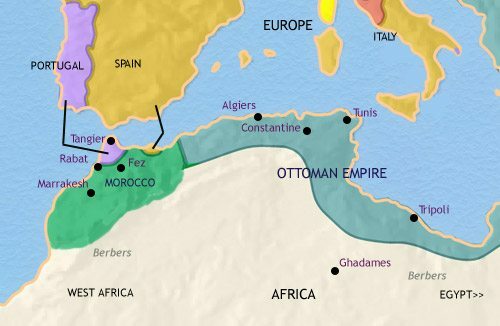 The difficulties of keeping such an empire together have proved too much, and by this date the Moroccan colonies on the Niger are virtually inpendendent states.